Studies suggest that consuming foods and beverages rich in these compounds may help prevent disease. Naturally occurring compounds, known as phytochemicals (phyto means plant in Greek) are thought to be largely responsible for the protective health benefits of these plant-based foods and beverages, beyond those conferred by their vitamin and mineral contents. These phytochemicals, which are part of a large and varied group of chemical compounds, also are responsible for the color, flavor, and odor of plant foods, such as blueberries’ dark hue, broccoli’s bitter taste, and garlic’s pungent odor. Research strongly suggests that consuming foods rich in phytochemicals provides health benefits, but not enough information exists to make specific recommendations for phytochemical intake. This continuing education course discusses the classification and mechanisms of action of phytochemicals; explores research concerning their role in the prevention of cardiovascular disease, cancer, and diabetes as well as neurological diseases such as Parkinson’s and Alzheimer’s; and provides suggestions RDs can share with clients for consuming phytochemical-rich foods. Phytochemicals, also referred to as phytonutrients, are found in fruits, vegetables, whole grains, legumes, beans, herbs, spices, nuts, and seeds and are classified according to their chemical structures and functional properties. The terminology used to describe phytochemicals (flavonoids, flavonols, flavanols, proanthocyanidins, procyanidins) can be confusing. Phytochemicals include compounds such as salicylates, phytosterols, saponins, glucosinolates, polyphenols, protease inhibitors, monoterpenes, phytoestrogens, sulphides, terpenes, lectins, and many more. The Phytochemical Family Tree (see below) shows the major groups of phytochemicals found in foods. Flavonoids are the largest, most varied, and most studied group of phytochemicals. 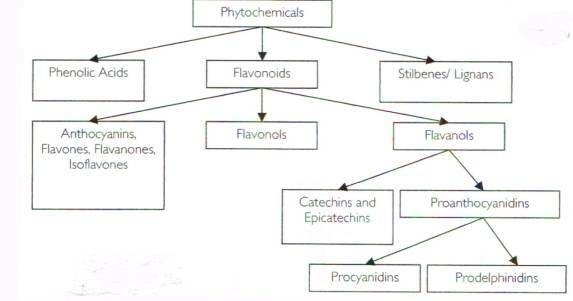 In fact, more than 6,000 flavonoids that occur in plant foods have been described.11 Plants typically produce several phytochemicals that act as a protective mechanism against environmental stressors; the more environmental stressors, the more phytochemicals a plant produces.12 As a result, phytochemical content can vary with growing conditions. As mentioned, research on specific phytochemicals in foods and their effects on disease risk is limited, but there’s enough evidence—mostly from looking at the association between foods rich in phytochemicals and disease risk—to strongly suggest that consuming foods and beverages rich in these compounds may help prevent disease. However, it isn’t known whether the health benefits are the result of individual phytochemicals, the interaction of various phytochemicals, the fiber content of plant foods, or the interaction of phytochemicals and the vitamins and minerals found in the same foods. 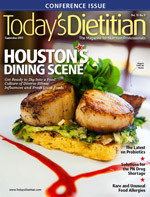 The consumption of cruciferous vegetables such as broccoli, cabbage, and cauliflower has been associated with a decreased risk of prostate, lung, breast, and colon cancers.31 Isothiocyanate phytochemicals found in cruciferous vegetables, especially sulforaphane in broccoli, which has been studied extensively, are believed to offer some degree of prevention. Therapeutic combinations of foods rich in phytochemicals that have yet to be identified could be effective for both cancer prevention and treatment.22 There’s also evidence that some phytochemicals may have varying effects with respect to cancer risk, depending on an individual’s age and genetic makeup. Isoflavones, for example, have estrogenlike effects and either may increase or decrease risk of breast cancer, depending on genetics and menopausal status.32 Some phytochemicals, such as resveratrol, sulforaphane, curcumin, quercetin, and genistein, may enhance the action of chemotherapeutic agents used to treat cancer.33-35 However, it’s too early to recommend phytochemicals or specific combinations of foods as a way to prevent cancer or increase the effectiveness of chemotherapy. The polyphenols in tea and cocoa also may contribute to improved insulin sensitivity and lower type 2 diabetes risk. In a large population study from eight European countries, tea intake was associated with a significantly decreased risk of developing type 2 diabetes.46 Specifically, those who drank more than four cups of tea per day had a 16% lower risk compared with non-tea drinkers. Combining specific dietary flavonoids that are absorbed well and can penetrate the blood/brain barrier (which exists to prevent many substances in the blood from reaching the brain), thus preventing or slowing the production of damaging free radicals in the body, could help prevent and treat a variety of neurodegenerative disorders.59 But this uniquely effective combination of phytochemicals hasn’t yet been identified. Much laboratory research has focused on the antioxidant function of phytochemicals. However, their antioxidant activity is reduced in the body during metabolism, and the levels present in blood and tissue are fleeting and quite low.63,64 For many of the phytochemicals in food, their antioxidant effects on cell signaling and gene expression may be more important for health benefits than direct antioxidant activity,63 effects that can be seen even with low concentrations of phytochemicals in plasma and tissues. In addition to being rich sources of phytochemicals, plant foods also are sources of fiber, vitamins, and minerals whose mechanisms have been more clearly elucidated. But identifying which individual compounds are responsible for the benefits associated with phytochemical-rich foods is difficult, if not impossible, because of the interactions that occur with vitamins, minerals, and fiber as well as among the phytochemicals themselves. The unique combination of these compounds may be the key to reduced disease risk, but that formula hasn’t yet been identified and tested. Phytochemicals are widely distributed in the food supply, yet because of the lack of an accurate, comprehensive database, estimating intake remains difficult. This affects researchers’ ability to determine what level of phytochemical intake is optimal or what level of intake could potentially pose a health risk. One of the major functions of phytochemicals is their role as antioxidants. However, as with all antioxidant compounds, once they’ve carried out their antioxidant function, they become oxidizing compounds themselves. While it would be difficult to get excessive amounts of antioxidant phytochemicals from the diet, large doses of antioxidants in the form of supplements have the potential to be harmful. While the associations found regarding a diet rich in fruits, vegetables, tea, whole grains, and other plant foods are consistent and strong, they don’t demonstrate a clear cause and effect relationship. However, experts such as the 2010 Dietary Guidelines for Americans Committee1 and the American Institute for Cancer Research3 agree that consuming a variety of plant-based foods is important for health. Research shows that those who meet the recommendations for fruit and vegetable consumption have considerably higher intakes of phytochemicals. The best advice for clients and patients is to consume a wide variety of plant-based foods, using MyPlate, which recommends three to five servings of fruits and vegetables per day, at least three daily servings of whole grains, and including beans, legumes, roasted soybeans (1/4 cup cooked), and nuts or seeds (1/2 oz) as protein choices.67 There are no guidelines for coffee, tea, or cocoa consumption, but as long as their intake is factored into the day’s intake of calories, moderate consumption of all three may offer additional health benefits. Bear in mind that dark chocolate is richer in phytochemicals than milk chocolate, and tea varieties (white, green, oolong, and black) have different amounts and types of phytochemicals that may provide different health benefits. 1. Define and discuss phytochemicals. 2. Distinguish foods that are rich in phytochemicals. 3. Identify at least one condition or disease for which research suggests eating phytochemical-rich foods may decrease risk. 4. Assess limitations of current research regarding phytochemicals and disease. 5. Provide clients and patients with recommendations for consuming phytochemical-rich foods. 1. Which of the following best defines phytochemicals? a. Phytochemicals are foods that contain chlorophyll. b. Phytochemicals are compounds found only in fruits and vegetables. c. Phytochemicals are compounds found in all plant foods. d. Phytochemicals are compounds found only in supplements. 2. Which group of foods below is not a rich source of phytochemicals? 3. Research conclusively has shown that diets rich in certain phytochemicals can reduce the risk of several common diseases. 4. Studies have found that diets rich in phytochemicals may help prevent which of the following? 5. What is the best dietary advice for consuming phytochemicals? a. Eliminate animal products from the diet. b. Eat raw phytochemical-rich foods. c. Take probiotics along with phytochemical-rich foods. d. Consume at least three to five servings of fruits and vegetables and three servings of whole grains per day. 6. What is the largest and most varied group of phytochemical compounds found in food? 7. If the diet provides few phytochemical-rich foods, phytochemical supplements are recommended. 8. Which of the following foods has not been linked to a reduced risk of type 2 diabetes? 9. Studies on the effects of phytochemicals on health have been hindered the most by which of the following? 10. Phytochemicals are thought to be involved in which of the following? 1. US Department of Agriculture, US Department of Health and Human Services. Dietary Guidelines for Americans, 2010. 7th ed. Washington, DC: US Government Printing Office; 2010. 2. Hung HC, Joshipura KJ, Jiang R, et al. Fruit and vegetable intake and risk of major chronic disease. J Natl Cancer Inst. 2004;96(21):1577-1584. 3. World Cancer Research Fund/American Institute for Cancer Research. Food, Nutrition, Physical Activity, and the Prevention of Cancer: A Global Perspective. Washington, DC: American Institute for Cancer Research, 2007. 4. Slavin JL, Lloyd B. Health benefits of fruits and vegetables. Adv Nutr. 2012;3(4):506-516. 6. Bohn SK, Ward NC, Hodgson JM, Croft KD. Effects of tea and coffee on cardiovascular disease risk. Food Funct. 2012;3(6):575-591. 7. Cano-Marquina A, Tarin JJ, Cano A. The impact of coffee on health. Maturitas. 2013; 75(1):7-21. 8. Kokubo Y, Iso H, Saito I, et al. The impact of green tea and coffee consumption on the reduced risk of stroke incidence in Japanese population: The Japan Public health center-based study cohort. Stroke. 2013;44(5):1369-1374. 9. Andujar I, Recio MC, Giner RM, Rios JL. Cocoa polyphenols and their potential benefits for human health. Oxid Med Cell Longev. 2012; 2012:906252. 10. Erdman JW Jr, Balentine D, Arab L, et al. Flavonoids and heart health: Proceedings of the ILSI North America Flavonoids Workshop, May 31-June 1, 2005, Washington, DC. J Nutr. 2007;137(3 Suppl 1):718S-737S. 11. Arts IC, Hollman PC. Polyphenols and disease risk in epidemiologic studies. Am J Clin Nutr. 2005;81(1 Suppl):317S-325S. 12. Chalker-Scott L. Environmental significance of anthocyanins in plant stress responses. Photochem Photobiol. 1999;70(1):1-9. 13. Murphy MM, Barraj LM, Herman D, Bi X, Cheatham R, Randolph RK. Phytonutrient intake by adults in the United States in relation to fruit and vegetable consumption. J Acad Nutr Diet. 2012;112(2):222-229. 14. Dauchet L, Amouyel P, Hercberg S, Dallongeville J. Fruits and vegetable consumption and risk of coronary heart disease: a meta-analysis of cohort studies. J Nutr. 2006:136(10):2588-2593. 15. He FJ, Nowson CA, Lucas M, MacGregor GA. Increased consumption of fruit and vegetables is related to a reduced risk of coronary heart disease: meta-analysis of cohort studies. J Hum Hypertens. 2007:21(9):717-728. 16. Suzuki Y, Miyoshi N, Isemura M. Health-promoting effects of green tea. Proc Jpn Acad Ser B Phys Biol Sci. 2012;88(3):88-101. 17. Bahorun T, Luximon-Ramma A, Neergheen-Bhuju V, et al. The effect of black tea on risk factors of cardiovascular disease in a normal population. Prev Med. 2012;54 Suppl:S98-102. 18. Fisher ND, Hollenberg NK. Aging and vascular responses to flavanol-rich cocoa. J Hypertens. 2006;24(8):1575-1580. 19. Mellen PB, Walsh TF, Herrington DM. Whole grain intake and cardiovascular disease: a meta-analysis. Nutr Metab Cardiovasc Dis. 2008;18(8):283-290. 20. Ye EQ, Chacko SA, Chou EL, Kugizaki M, Liu S. Greater whole-grain intake is associated with lower risk of type 2 diabetes, cardiovascular disease, and weight gain. J Nutr. 2012;142(7):1304-1313. 21. Fardet A. New hypotheses for the health-protective mechanism of whole-grain cereals: what is beyond fibre? Nutr Res Rev. 2010;23(1):65-134. 22. Wang L, Gaziano JM, Liu S, Manson JE, Buring JE, Sesso HD. Whole- and refined-grain intakes and the risk of hypertension in women. Am J Clin Nutr. 2007;86(2):472-479. 23. Tighe P, Duthie G, Vaughan N, et al. Effect of increased consumption of whole-grain foods on blood pressure and other cardiovascular risk markers in healthly middle-aged persons: a randomized controlled trial. Am J Clin Nutr. 2010;92(4):733-740. 24. Bodinham CL, Hitchen KL, Youngman PJ, Frost GS, Robertson MD. Short-term effects of whole-grain wheat on appetite and food intake in healthy adults: a pilot study. Br J Nutr. 2011;106(3):327-330. 25. Hui C, Qi X, Qianyong Z, Xiaoli P, Jundong Z, Mantian M. Flavonoids, flavonoid subclasses and breast cancer risk: a meta-analysis of epidemiologic studies. PLoS One. 2013;8(1):e54318. 26. Boeing H, Bechthold A, Bub A, Ellinger S, Haller D, et al. Critical review: vegetables and fruit in the prevention of chronic diseases. Eur J Nutr. 2012;51:637-663. 27. Wakai K, Matsuo K, Nagata C, et al. Lung cancer risk and consumption of vegetables and fruit: an evaluation based on a systematic review of epidemiological evidence from Japan. Jpn J Clin Oncol. 2011;41(5):693-708. 28. Aune D, Chan DS, Lau R, et al. Dietary fibre, whole grains, and risk of colorectal cancer: systematic review and dose-response meta-aalysis of prospective studies. BMJ. 2011;343:d6617. 29. McCullough ML, Robertson AS, Chao A, et al. A prospective study of whole grains, fruits, vegetables and colon cancer risk. Cancer Causes Control. 2003;14(10):959-970. 30. Romagnolo DF, Selmin OI. Flavonoids and cancer prevention: a review of the evidence. J Nutr Gerontol Geriatr. 2012;31(3):206-238. 31. Juge N. Mithen RF, Traka M. Molecular basis for chemoprevention by sulforaphane: a comprehensive review. Cell Mol Life Sci. 2007;64(9):1105-1127. 32. Bondesson M, Gustafsson JA. Does consuming isoflavones reduce or increase breast cancer risk? Genome Med. 2010;2(12):90. 33. Sak K. Chemotherapy and dietary phytochemical agents. Chemother Res Pract. 2012;2012:282570. 34. Kaminski BM, Steinhilber D, Stein JM, Ulrich S. Phytochemicals resveratrol and sulforaphane as potential agents for enhancing the anti-tumor activities of conventional cancer therapies. Curr Pharm Biotechnol. 2012;13(1):137-146. 35. Vinod BS, Maliekal TT, Anto RJ. Phytochemicals as chemosensitizers: from molecular mechanism to clinical significance. Antioxid Redox Signal. 2013;18(11):1307-1348. 36. Yang CS, Lambert JD, Ju J, Lu G, Sang S. Tea and cancer prevention: molecular mechanisms and human relevance. Toxicol Appl Pharmacol. 2007;224(3):265-273. 37. Yang CS, Ju J, Lu G, et al. Cancer prevention by tea and tea polyphenols. Asia Pac J Clin Nutr. 2008;17(Suppl 1):245-248. 38. Thakur VS, Gupta K, Gupta S. The chemopreventive and chemotherapeutic potentials of tea polyphenols. Curr Pharm Biotechnol. 2012;13(1):191-199. 39. Martin MA, Goya L, Ramos S. Potential for preventive effects of cocoa and cocoa polyphenols in cancer. Food Chem Toxicol. 2013;56:336-351. 40. Gonzalez-Castejon M, Rodriguez-Casado A. Dietary phytochemicals and their potential effects on obesity: a review. Pharmacol Res. 2011;64(5):438-455. 41. Cooper AJ, Forouhi NG, Ye Z,, et al. Fruit and vegetable intake and type 2 diabetes: EPIC-InterAct prospective study and meta-analysis. Eur J Clin Nutr. 2012;66(10):1082-1092. 42. Carter P, Gray LJ, Troughton J, Khunti K, Davies MJ. Fruit and vegetable intake and incidence of type 2 diabetes mellitus: systematic review and meta-analysis. BMJ. 2010;341:c4229. 43. Hanhineva K, Torronen R, Bondia-Pons I, et al. Impact of dietary polyphenols on carbohydrate metabolism. Int J Mol Sci. 2010;11(4):1365-1402. 44. Wedick NM, Pan A, Cassidy A, et al. Dietary flavonoid intakes and risk of type 2 diabetes in US men and women. Am J Clin Nutr. 2012;95(4):925-933. 45. Song Y, Manson JE, Buring JE, Sesso HD, Liu S. Associations of dietary flavonoids with risk of type 2 diabetes, and markers of insulin resistance and systemic inflammation in women: a prospective study and cross-sectional analysis. J Am Coll Nutr. 2005;24(5):376-384. 46. The InterAct Consortium. Tea consumption and incidence of type 2 diabetes in Europe: the EPIC-InterAct case-cohort study. PLoS One. 2012;7(5):e36910. 47. Curtis PJ, Sampson M, Potter J, Dhatariya K, Kroon PA, Cassidy A. Chronic ingestion of flavan-3-ols and isoflavones improves insulin sensitivity and lipoprotein status and attenuates estimated 10-year CVD risk in medicated postmenopausal women with type 2 diabetes: a 1-year, double-blind, randomized, controlled trial. Diabetes Care. 2012;35(2):226-232. 48. de Munter JS, Hu FB, Spiegelman D, Franz M, van Dam RM. Whole grain, bran, and germ intake and risk of type 2 diabetes: a prospective cohort study and systematic review. PLoS Med. 2007;4(8):e261. 49. Hauner H, Bechthold A, Boeing H, et al. Evidence-based guideline of the German Nutrition Society: carbohydrate intake and prevention of nutrition-related diseases. Ann Nutr Metab. 2012;60 Suppl 1:1-58. 50. Lee JG, Yon JM, Lin C, Jung AY, Jung KY, Nam SY. Combined treatment with capsaicin and resveratrol enhances neuroprotection against glutamate-induced toxicity in mouse cerebral cortical neurons. Food Chem Toxicol. 2012;50(11):3877-3885. 51. Davinelli S, Sapere N, Zella D, Bracale R, Intrieri M, Scapagnini G. Pleiotropic protective effects of phytochemicals in Alzheimer’s Disease. Oxid Med Cell Longev. 2012;2012:386527. 52. Mythri RB, Bharath MM. Curcumin: a potential neuroprotective agent in Parkinson’s disease. Curr Pharm Des. 2012;18(1):91-99. 53. Spencer JP. Flavonoids and brain health: multiple effects underpinned by common mechanisms. Genes Nutr. 2009;4(4):243-250. 54. Williams RJ, Spencer JP. Flavonoids, cognition, and dementia: actions, mechanisms, and potential therapeutic utility for Alzheimer disease. Free Radic Biol Med. 2012:52(1):35-45. 55. Kandinov B, Giladi N, Korczyn AD. Smoking and tea consumption delay onset of Parkinson’s disease. Parkinsonism Relat Disord. 2009;15(1):41-46. 56. Hu G, Bidel S, Jousilahti P, Antikainen R, Tuomilehto J. Coffee and tea consumption and the risk of Parkinson’s disease. Mov Disord. 2007;22(15):2242-2248. 57. Tanaka K, Miyake Y, Fukushima W, et al. Intake of Japanese and Chinese teas reduces risk of Parkinson’s disease. Parkinsonism Relat Disord. 2011;17(6):446-450. 58. Gao X, Cassidy A, Schwarzschild MA, Rimm EB, Ascherio A. Habitual intake of dietary flavonoids and risk of Parkinson disease. Neurology. 2012;78(15):1138-1145. 59. Jones QR, Warford J, Rupasinghe HP, Robertson GS. Target-based selection of flavonoids for neurodegenerative disorders. Trends Pharmacol Sci. 2012;33(11):602-610. 60. Fisher ND, Sorond FA, Hollenberg NK. Cocoa flavanols and brain perfusion. J Cardiovasc Pharmacol. 2006;47 Suppl 2:S210-S214. 61. Francis ST, Head K, Morris PG, Macdonald IA. The effect of flavanol-rich cocoa on the fMRI response to a cognitive task in healthy young people. J Cardiovasc Pharamcol. 2006;47 Suppl 2:S215-S220. 62. Zhao L, Mao Z, Brinton RD. A select combination of clinically relevant phytoestrogens enhances estrogen receptor beta-binding selectivity and neuroprotective activities in vitro and in vivo. Endocrinology. 2009;150(2):770-783. 63. Gordon MH. Significance of dietary antioxidants for health. Int J Mol Sci. 2012;13(1):173-179. 64. Tsao R. Chemistry and biochemistry of dietary polyphenols. Nutrients. 2010;2(12):1231-1246. 65. Da Costa LA, Garcia-Bailo B, Badawi A, El-Sohemy A. Genetic determinants of dietary antioxidant status. Prog Mol Biol Transl Sci. 2012;108:179-200. 66. Mahn A, Reyes A. An overview of health-promoting compounds of broccoli (Brassica oleracea var. italic) and the effect of processing. Food Sci Technol Int. 2012;18(6):503-514.